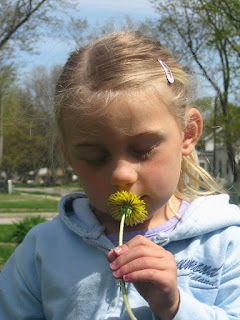 Since the weather was so nice on Monday we spent the ENTIRE day outside. It is so much easier to entertain a 3 1/2 year old who is up at 6:00 and doesn't nap when there's the option to go outside. After a long morning walk that included stops at the bank, post office and of course the bakery for a donut Jenna helped me tend to some much needed weed pulling and cleaning out the old and broken sand box toys. 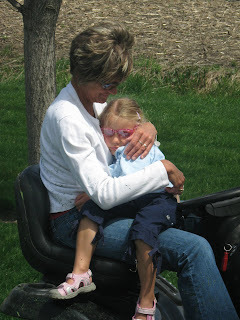 She wanted to call Grandma to see what she was doing, when Grandma told Jenna she was going to mow the lawn Jenna was very excited so we went to her house for a couple hours. 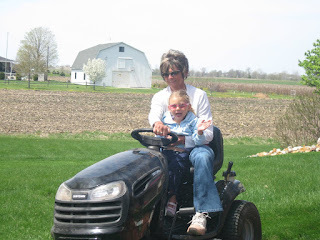 I pulled weeds in all of grandma's landscaping while Jenna rode the tractor (something that isn't needed in the city so it's a special treat for Jenna)! She was having a ball "driving". She is such a typical girl and looses focus easily.